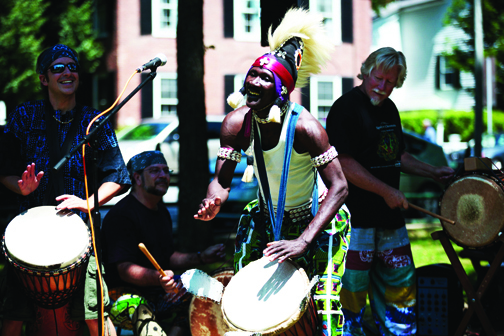 Sayon Plays with Landaya in Woodstock Twice This Week: Thursday 8/8 and Saturday 8/10! Catch a Sayon Camara & Landaya performance today at noon (on the Green or in the Town Hall Theatre, depending on the weather). And again at the Woodstock Summer Fest on Saturday in the village of Woodstock VT… showtime is at 1:30 – don’t miss it. And if you’re around for the whole day Sayon will be doing a mini workshop at the Artistree tent as well. Take a chance and experience the joy of drumming with Sayon! This entry was posted on Thursday, August 8th, 2013 at 10:52 am	and tagged with djembe, djembefola, drumming, drums, sayon camara and posted in Performances. You can follow any responses to this entry through the RSS 2.0 feed. « Heading to Bath, Maine in 2 Days!